Not everyone realizes how popular the Duck Down family is. On the West Coast, heads mostly remember them for the impressive run of albums they generated in the early 90s, just before the jiggy era permanently consigned dusted hip-hop styles to the underground. But on the East Coast, Duck Down is a full-blown cult that’s highly admired for staying true to its core values of uncompromising street rap over more than a decade. 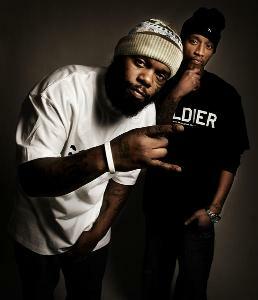 Smif-N-Wessun — also known as Cocoa Brovaz — may be the most popular group of the collective. Tek and Steele have cranked out a series of hits during its career, from its classic debut Dah Shinin to “Super Brooklyn.” Their fourth album, The Album, includes cameos from Rock from Heltah Skeltah and Joell Ortiz (on the first single, “Stomp Thru”) and beats from Tommy Tee, Ken Ring and others. As previously reported, it arrives amidst a heavy schedule for the mighty Duck Down Enterprises. The Album drops October 23. The track listing is below. This entry was posted in News and tagged Duck Down, Smif-N-Wessun. Bookmark the permalink.